Robert, do you know that we have a links page? Got my armour class dirk, it shows that its not custom...like say a Vince Evans piece, but none the less a nice sharp blade. I'll do better pictures on the weekend when i have light, and make a review up. Henrik, Armour Class lists basic pricing on their website (200 pounds). Since the grips are basically custom-made, I'd contact them for exact pricing. Although that is Vince's "professional" (official) site (which gives the world a good idea of who & what he does) he tends to use his PictureTrail site for quick updates, news, and to list anything he wishes to sell, as the other site requires someone with alot more computer skills to change things ! So be sure and check http://www.picturetrail.com/vevans, as that is where the updates tend to happen ! heres a better picture folks...I will be doing a full review and Nathan has shown me the guide lines for such so it can go into the myArmoury review section. I'm going to have to get it done in the next 3 days though because i leave for the US then. 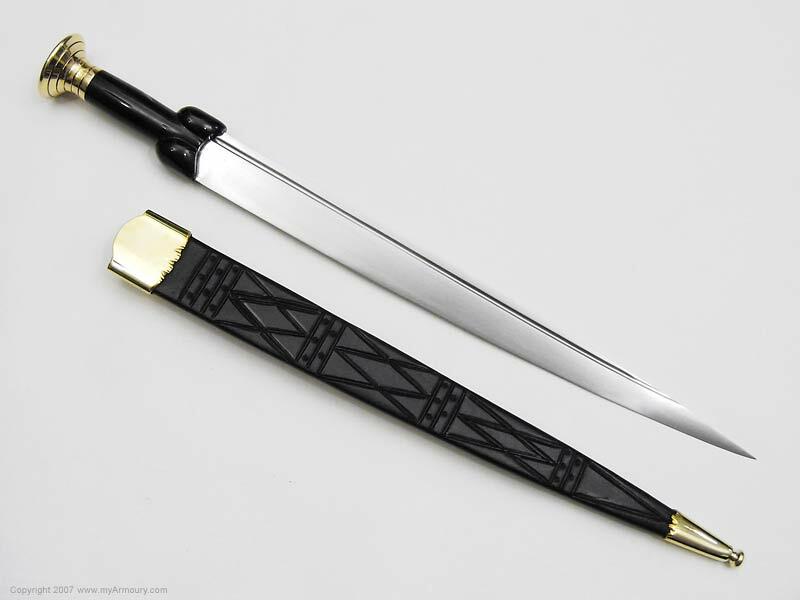 I do recommend however those wanting a production dirk that armour class's dirk is quite well made with a good heat treat. Hey Robert, it looks like a good sturdy dirk. 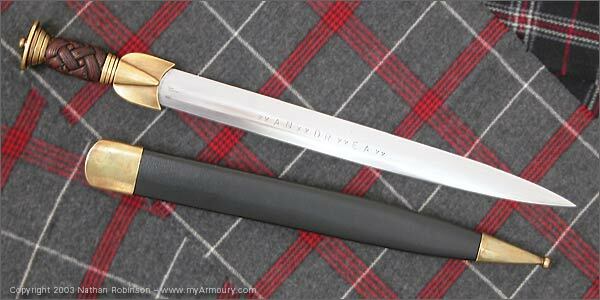 You've made me consider getting one too, as a nice companion piece for when my Armourclass Cup And Ring Baskethilt gets here. 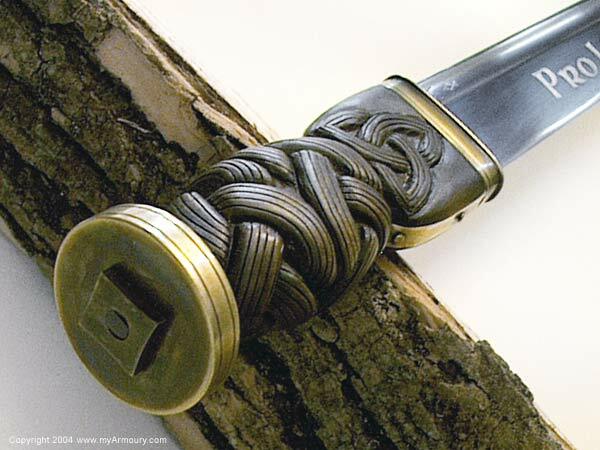 Is the sheath an option, or standard?? Anyone else who wants to add theirs to the thread, feel free. 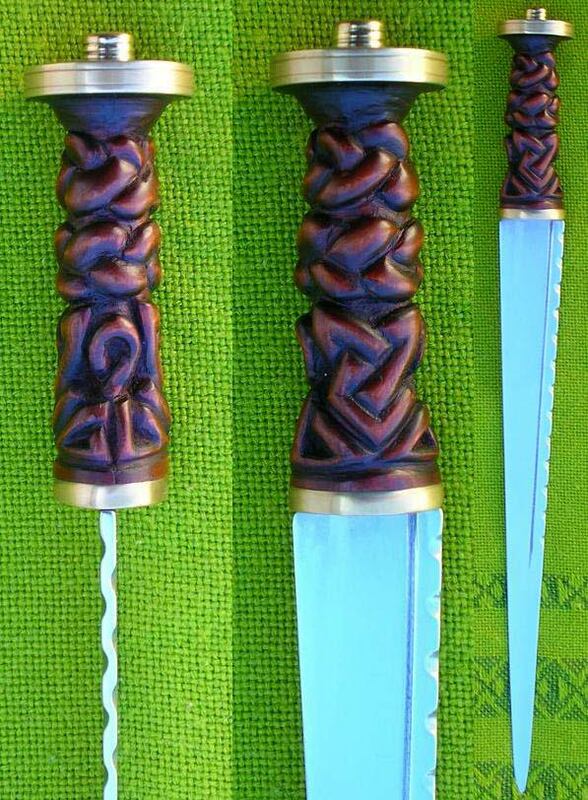 Here are two Scottish dirks made by Vince Evans that I once owned and had to sell due to the fiscal realities that hit us all from time to time. I do miss these pieces quite a bit and often look back at the photos. And below are two additional Vince Evans dirks I've photographed recently. The top dirk, in the bottom photo, looks almost exactly like the dirk in Vince's photo CD. 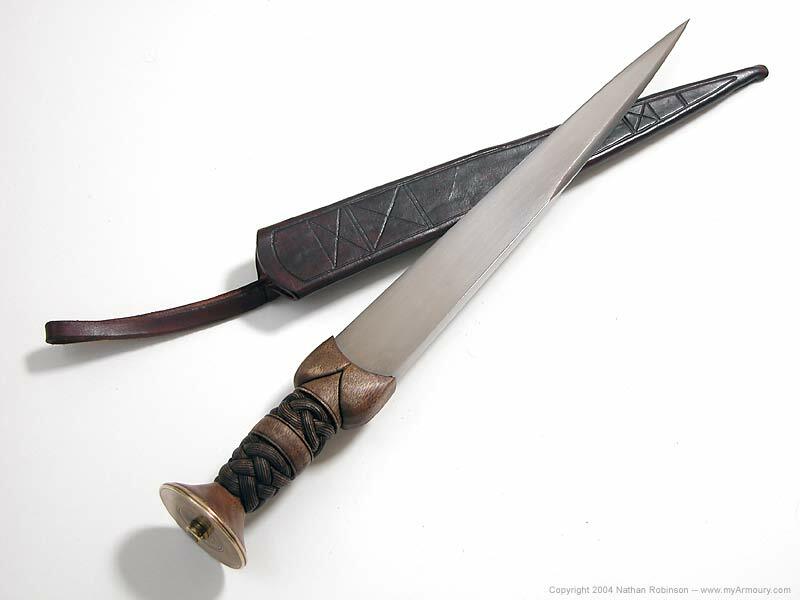 However, it has two pins retaining the reinforcing strip on the haunce and the dirk on the CD, I believe, only has one pin with the strip extending under the binding on the bottom of the hilt. The guy certainly builds beautiful dirks. 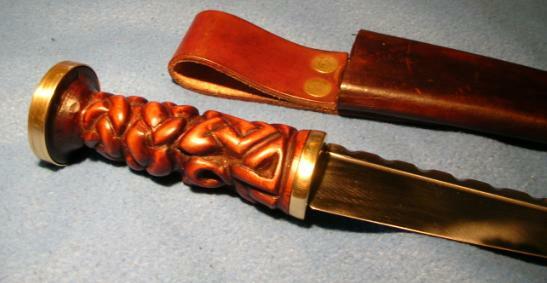 I got this a long while ago, when I didn't know much about 'autenticity' or 'research' and instead left it up to a custom knife maker. I spent quite a large sum on it to, and whilst happy for a time, more recently I've become disatisfied with it, and think in future I'll sell it on and get another one based more accurately on surviving pieces. Though I do think I need a targe now! Bask in my poor photography skills! The top dirk, in the bottom photo, looks almost exactly like the dirk in Vince's photo CD. However, it has two pins retaining the reinforcing strip on the haunce and the dirk on the CD, I believe, only has one pin with the strip extending under the binding on the bottom of the hilt.. 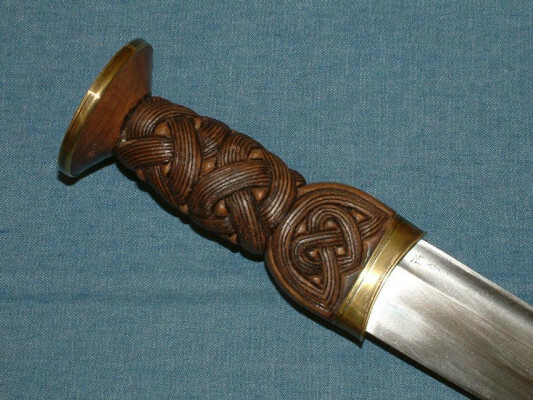 If you look closely at the mid part of the grip, it appears to be one continuous section of knot-work. The dirk in the photo CD is done with two separate bands if knot-work like the dirk at the bottom of the photo (which appears to be more common based on the originals I have seen). 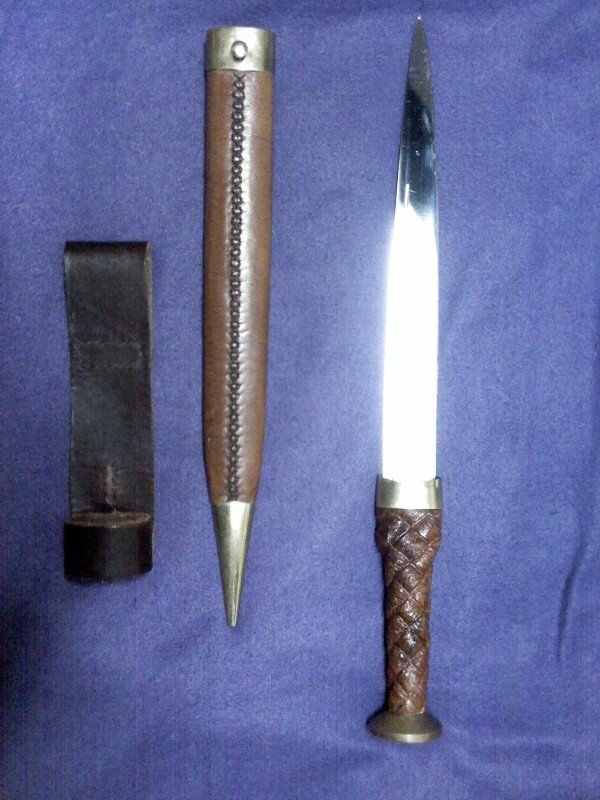 The grip on the dirk above also tapers quite a bit from the base to the pommel. I wonder if the two dirks above are based on particular originals. The bottom dirk in particular is so a-typical of the dirks Vince makes, it would lead me to believe he was copying an original piece for that one. 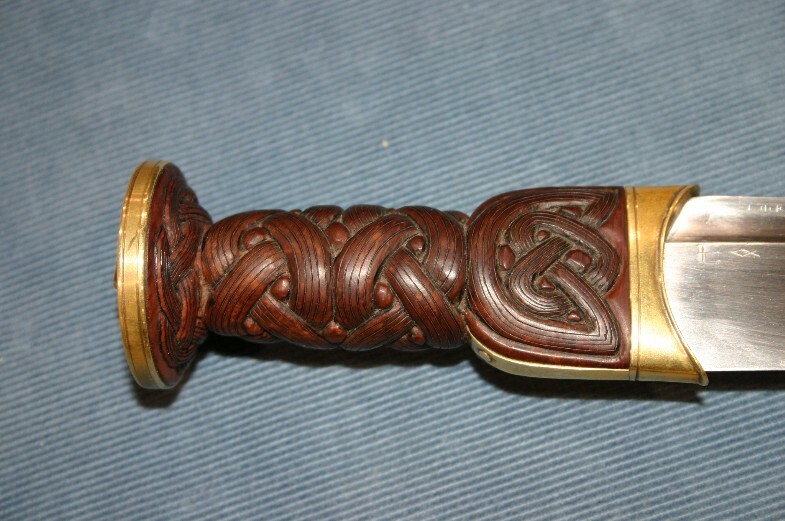 If you look closely at the mid part of the grip, it appears to be one continuous section of knot-work. The dirk in the photo CD is done with two separate bands if knot-work like the dirk at the bottom of the photo (which appears to be more common based on the originals I have seen). 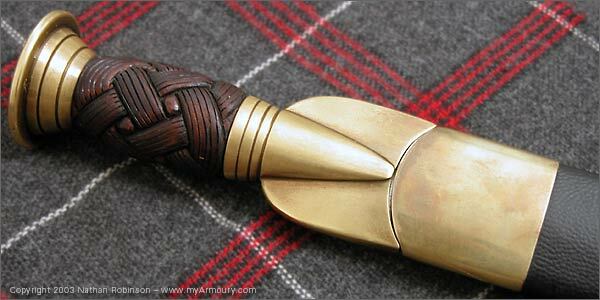 The grip on the dirl above also tapers quite a bit from the base to the pommel. Right you are Chris. I see that very clearly now. I believe that Vince does base some of his work on originals but, quite frankly, what he does seems to be far more ornate and better made than the originals. The Armour Class dirks pictured in this thread look more like some of the antiques I have seen. 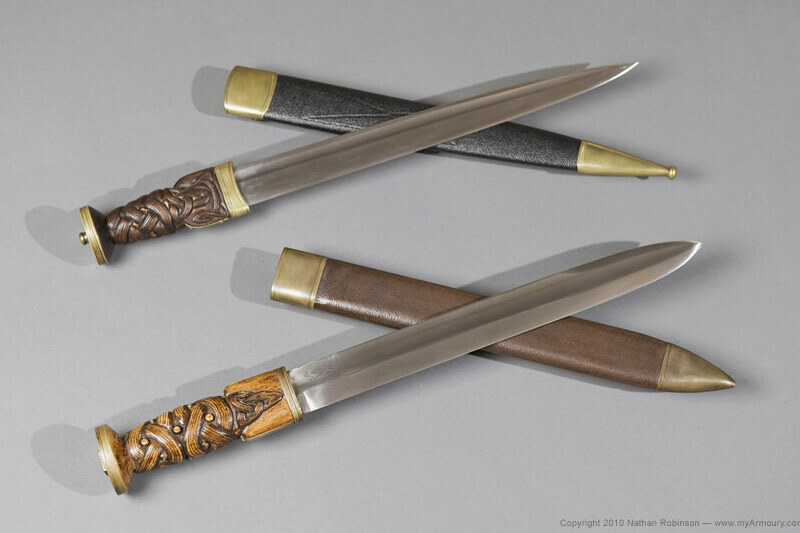 Yes, I agree that the bottom dirk is probably more like an original and may have been copied from one. I just love his dirks, plan and simple. What a great craftsman he is and also so generous to make his techniques available to the rest of us. Of course the CD says that his wife does the carving. Is that some or all of the carving? Somewhere, perhaps on his web site, I once saw a photo of her burning in the lines on the interlace. I still have a few questions from looking at the CD and will probably send him a PM. I doubt we should use the forum for that, unless the adminstrators bless it. There is a lot of variety to be found in antique dirks. Attached are examples of other dirks made by Vince Evans. Note that the first one has a similar pattern of knot-work on the haunches as the dirk in my photograph that you're discussing. And these photos show variety in the mid-section, too, with variations that seem to be, as you say, two separate bands or some that are single-bands. Neat stuff. How true! Especially when you compare dirks from the 17th, 18th and 19th centuries. 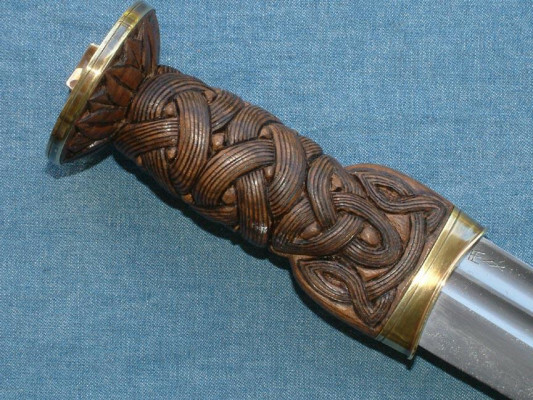 I should have been more clear with my comment about the double bands of knotwork being "common". I meant that comment to only apply to the early 18th century dirks I have seen, as the two examples in the referenced photo would be representative of that period. It would certainly not be true for 17th, late 18th or 19th century dirks I have seen. 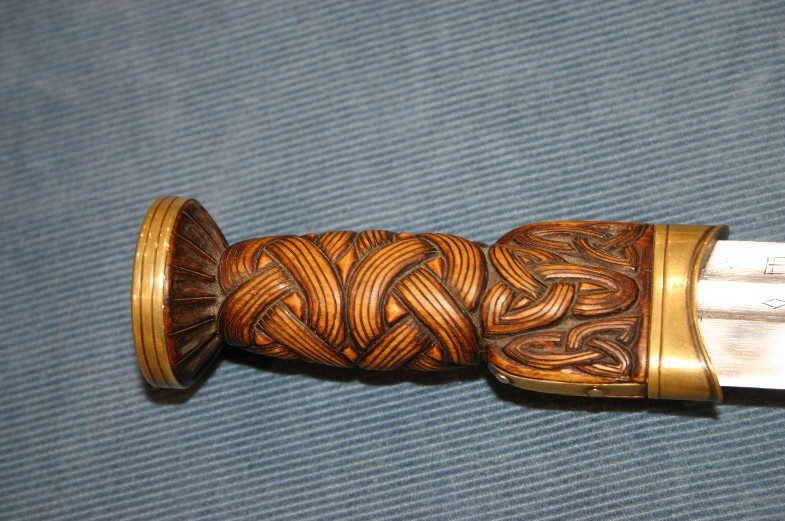 While I am at it, I should also add that I have seen examples of early 18th century dirks carved with a single continuous section of knotwork just as is shown in the example of the top dirk. 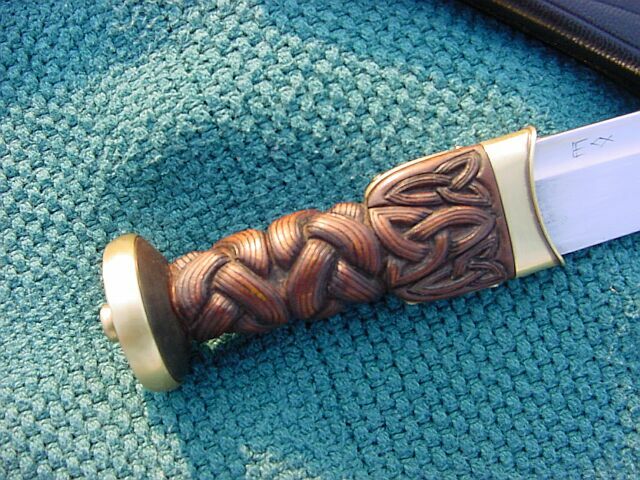 So, while I have not seen as many examples of that carving pattern, they are certainly out there... along with many other variations. I am very impressed with the great variety of grips Vince and Grace have produced over the years. Great to see all these photos of their work! Here are the two VE dirks in my care -- one mounted in german silver, the other in antiqued brass.